$41 million. From Sequoia Capital, Bain Capital, and Silicon Valley Bank. Pre-launch. But the founding team goes a long way toward explaining it. Headed by Bill Nguyen — who sold Lala to Apple in late 2009 — the company has attracted a wealth of talent. It has seven founders including Nguyen and company president Peter Pham, who previously was CEO of BillShrink. And its chief of product is DJ Patil, who was previously LinkedIn’s chief scientist. So what exactly is Color? Update: The application is now available for the iPhone at Color.com. Android is coming tonight. 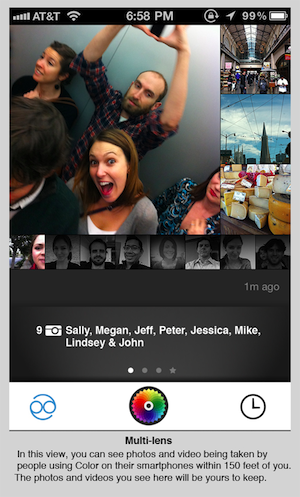 At first glance, it looks like another mobile photo app, like Path, Instagram, or PicPlz. 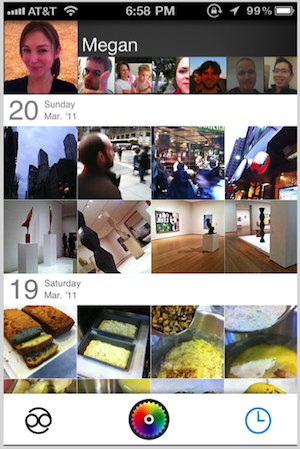 You take snapshots with your mobile phone (the app supports both Android and iOS at launch) and they appear in a stream of photos. And there aren’t even any of those trendy lenses to spruce up your images. Sounds pretty basic, right? But the beauty of Color stems from what it’s doing differently. Unlike Instagram and Path, there isn’t an explicit friend or following system — you don’t browse through lists of contacts and start following their photo stream. Instead, all social connections in the application are dynamic and established on-the-fly depending on whom you’re hanging out with. And your photos are shared with everyone in the vicinity. In some senses this is the Twitter of photo apps — it’s all public, all the time (I’m ignoring Twitter’s protected tweets, since most people don’t use them). Another way to look at it: it’s almost the complete opposite of Path, which is built around sharing photos with an intimate group of friends. It’s difficult to explain what Color does with a bullet list of features, so I’ll try painting an example that hopefully demonstrates how it works. Say you walk into a restaurant with twenty people in it. You sit down at a table with four friends, and start chatting. Then one of your friends pulls out their phone, fires up Color, and takes a snapshot of you and your buddies. That photo is now public to anyone within around 100 feet of the place it was taken. So if anyone else in the restaurant fires up Color, they’ll see the photograph listed in a stream alongside other photos that have recently been taken in the vicinity. In a crowded area these streams of photos will get noisy, so Color also has some grouping features. Tell it which four people you’re eating with, and Color will create a temporal group with a stream of just the photos you and your buddies have taken. But here’s the twist: because everything on the service is public, you can also swipe to view other groups, to see what the tables next to you are snapping photos of. And you can always jump to the main stream, which shows a mishmash of photos taken by everyone. It takes some time to wrap your head around, and my time with the app was limited, so I can’t really vouch for how well it works. But there’s some very interesting technology that’s working behind the scenes to make Color more than just a simple group photo app. First are the social connections, called your Elastic Network. All of your contacts are presented in a list of thumbnails ordered by how strong your connection is to that user. Whenever Color detects that you’re physically near another user (in other words, that you’re hanging out), your bond on the app gets a little stronger. So when you fire up the app and jump to your list of contacts, you’ll probably see your close friends and family members listed first. But if you don’t see a friend for a long time, they’ll gradually flow down the list, and eventually their photos will fade from color to black-and-white. These social connections are important because they’re the only way to view a stream of photos beyond those have been taken near you. If you fired up Color in that restaurant example from earlier, you’d only be able to see photos that had been taken by friends and strangers within 100 feet of that restaurant. That is, unless you jump to your social connections. Tap on your best friend’s profile photo, and you’ll then be able to see all of the photos that have recently been taken within 100 feet of them. In other words, Color is trying to give you a way to see everything that’s going on around you, and everything that’s going on around the people you care about. The Groups feature also makes use of this elastic network. In the restaurant example above, the application would likely already know who your friends were based on your previous interactions and would automatically place them in the same group — you wouldn’t have to manually do it yourself. Color is also making use of every phone sensor it can access. The application was demoed to me in the basement of Color’s office — where there was no cell signal or GPS reception. But the app still managed to work normally, automatically placing the people who were sitting around me in the same group. It does this using a variety of tricks: it uses the camera to check for lighting conditions, and even uses the phone’s microphone to ‘listen’ to the ambient surroundings. If two phones are capturing similar audio, then they’re probably close to each other. So far I’ve described a compelling and unique photo app with some neat tricks. But how exactly is Color going to make “wheelbarrows of cash”, as Nguyen says? At this point the company is still very early on, but it eventually plans to offer businesses a self-serve platform for running deals and ads as part of the Color experience (you fire up the app to see the photos being taken around you, and you also see the special of the day, for example). But that’s just the start. Nguyen has visions of fundamentally changing some aspects of social interaction and local discovery with the app, which he considers part of the so-called Post-PC movement. Using all of the data being collected (remember, the app is taking advantage of all of your phone’s sensors), Color hopes to eventually start recommending nearby points of interest, and maybe even interesting people. There are still plenty of questions, even about the existing service. This kind of voyeurism — you’re sharing photos with the world and looking at photos from strangers — could take a while to get used to. People may reject it entirely. Or it may be completely addictive. There’s really no way to tell until people start using the app in the wild. The future is unclear, but promising. And with this much money in the bank and a staff of 27, Color has plenty of time to hone in on what works.